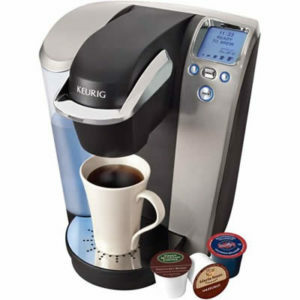 Home » Coffee Makers » Why Is Keurig Single Cup Coffee Maker So Popular? The Keurig single cup coffee maker offers you an incentive, the ability to brew one fresh cup of coffee within a minute. You don’t have to fight with other household members about which coffee is best. You can buy your favorite and they can buy theirs and each can have the perfect cup of coffee. The idea of the single cup coffee maker has revolutionized the way people think about coffee you can brew at home. No longer do you have to worry about exact measurements and whether it is going to be too strong or too weak. Here are the 3 latest models from Keurig, which fall in the category of single cup coffee maker. Offering two brewing sizes, 9.25 oz. or 7.25 oz.,the Keurig Elite B40 is the smallest of the Keurig Single Cup Coffee Maker family. The Keurig Elite B40 allows you to choose between two sizes of cups that you may want for each cup of coffee by simple pushing a button on the control panel on top of the machine. The 48 oz. water reservoir provides fresh water for several cups of coffee before refilling again. It comes with a removable drip tray that’s easy to clean. When it is removed, you can place your travel mug under the brewer for the perfect cup of coffee to go. Anther one in the keurig home use of single cup coffee makers is the Keurig B60. It offers 3 cup sizes of 5.25 oz, 7.25 oz and 9.25 oz. Withe th removable 48 oz water reservoir. Comes with additional features to the Keurig B40 model, like a backlit programmable LCD messege center. It can be quiet a useful feature to have, as it displays messegs like when the machine is ready to brew or when the watre reservoir needs filling up. The Keurig Elite B40’s and Keurig B60’s big brother is the Keurig Platinum B70. It offers four brewing sizes and it is dressed up on the outside with chrome accents making it a perfect fit for a modern kitchen. It has Quiet Brew Technology and features a removable 60 oz. water reservoir and an easily cleaned removable drip tray. The next step in single cup coffee makers dictates that you can have your coffee ready as soon as you need it by programming it ahead of time. Simply program the time you need your coffee, insert your K-Cup, make sure there is plenty of water and then allow your mind to visit other important matters for the day. 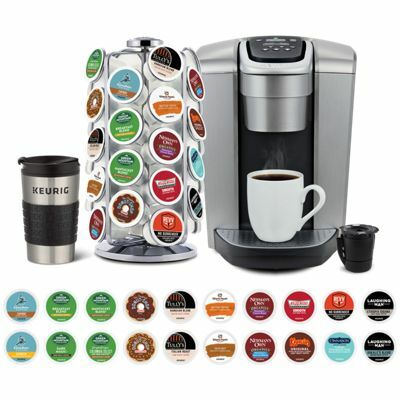 Using the K-Cups engineered by Keurig, you?ll be able to choose the perfect cup of coffee every time. K-Cups contain everything you need for one perfect up of coffee. Choose from Caribous Coffee, Emeril’s, Newman’s Own Organics, as well as various other varieties. If you want a personalized brew, you can purchase the My K-Cup adapter and blend until your heart’s content. Simply rinse the K-Cup between uses to keep it fresh and clean. The K-Cups fit into all the Keurig single cup coffee maker models. You fit the K-cup and they are locked in to place. As the water heats, it is pressurized and it flows through the system and into the miniature coffee filter. As it is brewed and fills your cup, it makes the perfect cup of coffee every time because the K-Cups are precisely filled and you?ve been able to choose your favorite blend. Pause now and ask yourself, “What kind of coffee do I want in the morning?” Then again, ask another question. “Well, what kind do I want tomorrow afternoon?” “What kind does my wife or my husband want?” Are there different answers? If so, you owe it to yourself to try a Keurig Single Cup Coffee Maker today.